Many migraine sufferers have monitored their severe headaches and the circumstances surrounding them, which has allowed them to identify their migraine triggers. By identifying the triggers that cause your migraines, you can minimize your exposure to painful headaches and lead a life that is much more enjoyable. Here are some of the common triggers that bring on migraines with many sufferers. 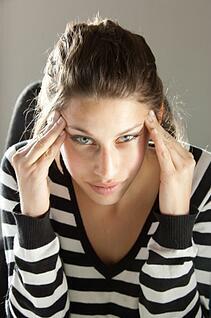 Some people experience migraines when they are in environments with bright, flickering lights. The pain may be caused by fluorescent light bulbs and strobe lighting, but it can also be caused by watching sunlight flicker through trees. If you think that the lights in your workplace are causing your migraines, talk to your employer. The law requires him or her to make reasonable accommodations so that you are less likely to suffer from headaches. Women often experience migraines when their hormone levels change during their menstrual cycles, menopause or pregnancy. While some birth control pills will help balance hormone levels to minimize the frequency and severity of migraines, other pills may actually make conditions worse. Thyroid issues, including hypothyroidism and hyperthyroidism, also play a part in causing migraine attacks. In most cases, only one or a few of these foods will trigger a migraine, which allows sufferers to continue to eat most of their favorite dishes. Certain smells may bring on a migraine for many people, including air fresheners, perfumes, scented candles and fumes from cleaning products. This chemical sensitivity should be treated as a disability by your employer so that you can work in peace and continue to be a productive and efficient employee. Dehydration is another trigger for some people, and it can be caused by a variety of factors. In some cases, alcohol and caffeine consumption can lead to dehydration, as can spending too much time in the heat. You should drink plenty of liquids throughout the day to make sure that you stay hydrated and comfortable. A migraine diary is an excellent way to determine which factors may be causing your symptoms. Write down when a migraine starts and stops, what you ate before it started, any activities or stress that may have caused it and the location of the pain. This information may help you uncover your triggers so that you can enjoy your life without worrying about whether a migraine headache will prevent you from participating in your favorite activities.